I keep telling myself that I need a pair of smart shoes, because I seem to be lacking in anything remotely smart to wear to events, work, or even out with friends (just in case we decide we want to go somewhere nice for dinner or drinks). It’s this recent revelation that lead me to start my hunt, and I think I may have finally found what I’ve been looking for. 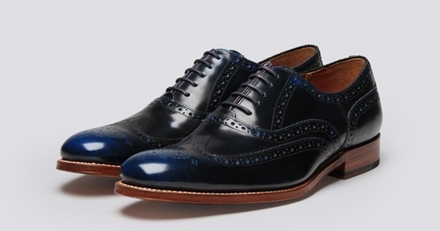 Grenson Shoes’ Dylan shoes feature a classic wing tip oxford brogue pattern and come in what they describe as a “rub off navy”, which I really like. I want something a little bit different, so not your traditional black or brown, and these are just that.